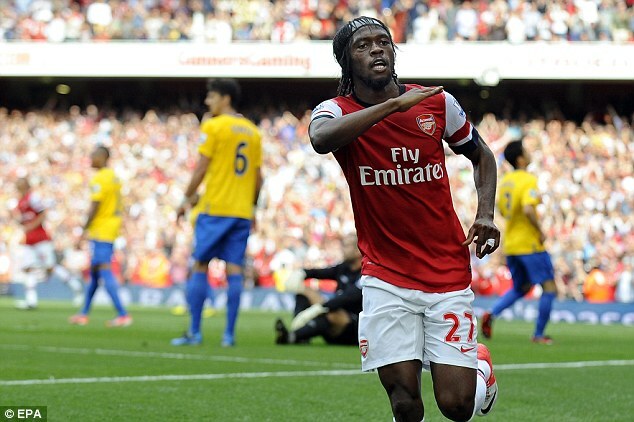 Ivory Coast star, Gervinho struck twice as Arsenal continued their unbeaten start to the season with a 6-1 demolition of Premier League new boys Southampton. The visitors resembled a rabbit in the headlights for most of the first half as they failed to deal with Arsenal's pace and directness - epitomised as early as the 11th minute as Jos Hooiveld accidentally put into his own net. Lukas Podolski bent in a 25-yard free-kick as the onslaught continued, before Gervinho rifled home and Nathaniel Clyne netted an own goal to make it 4-0 inside 37 minutes. Wojciech Szczesny's clanger denied the north Londoners a fourth successive clean sheet to start the season as the returning Poland international flapped at a cross late in the first half and Danny Fox lashed home. 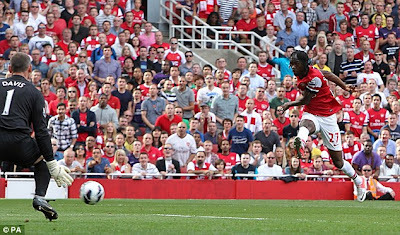 It proved a mere consolation, though, as Gervinho and former Southampton winger Theo Walcott netted in a more even second period to condemn Nigel Adkins' side to a fourth league defeat. Arsenal made three changes coming into the game, with Szczesny the standout returnee after missing recent matches with a rib injury. Saints, meanwhile, stuck with the same starting team that fell to a harsh 3-2 defeat to Manchester United before the international break, while new signings Gaston Ramirez and Maya Yoshida were named on the bench. The latter was brought in to shore up a weak Southampton defence that found itself under pressure from the outset in north London.